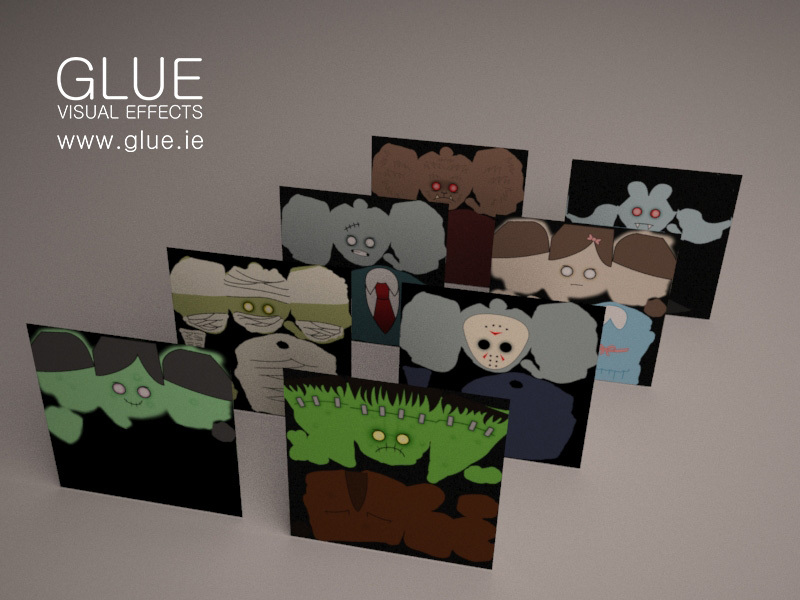 One of GLUE’s recent projects involved a Halloween themed 3D animation. 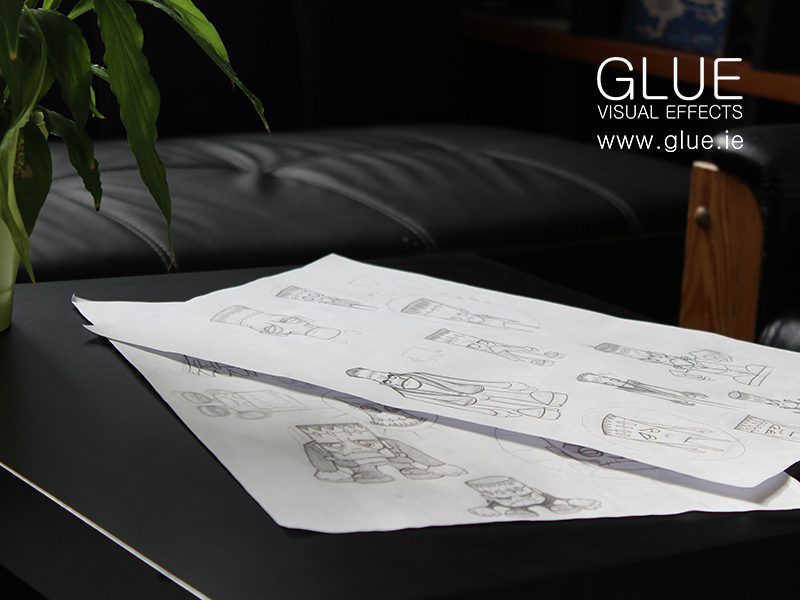 We detailed the concept and animation process in our previous blog “Creating 3D animated Characters”. Referencing is key for creating accurate 3D models. Before we started creating any 3D models for our animation we researched props and environments with Halloween or Frankenstein themes. This reference could then be used to inform the style and structure of assets in our scene. Not only does reference help with accuracy, but it’s great for inspiration too. We start with a general idea of our scene, and in the process of researching that world we discover flourishes and details that will really bring an environment to life. Once we were happy with the concept(in this case a dungeon like castle), and the scene was blocked out, the fun process of 3D modelling could begin. When creating an environment it’s important to first block out your scene so you can determine that the environment and cameras will match the storyboards. This process involves placing boxes into the scene as placeholders for the assets. As the team model the assets they can then drop them into the place of the boxes. The stairs were created using 3DS Max’s native stairs tool and then modified so that they looked like a grand staircase using the boolean tool. The steps on the staircase were simple pieces of geometry which were extruded out and separated into their own model as well as the carpet. 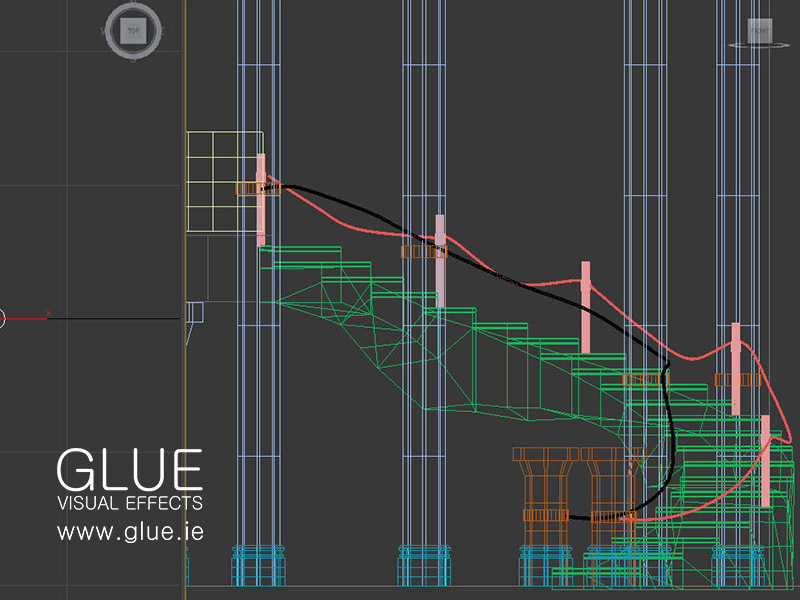 The ropes for the staircase were created with circle splines that were then lofted to a line laid out. Unfortunately this process meant a high polycount which isn’t great for render time. The great thing about 3D models though, is that there is always a way to make things easier. A low poly version of the rope was created and the high poly details were then baked onto it as a texture. Various chains were created for our scene. These were used to hang machinery from the ceiling. 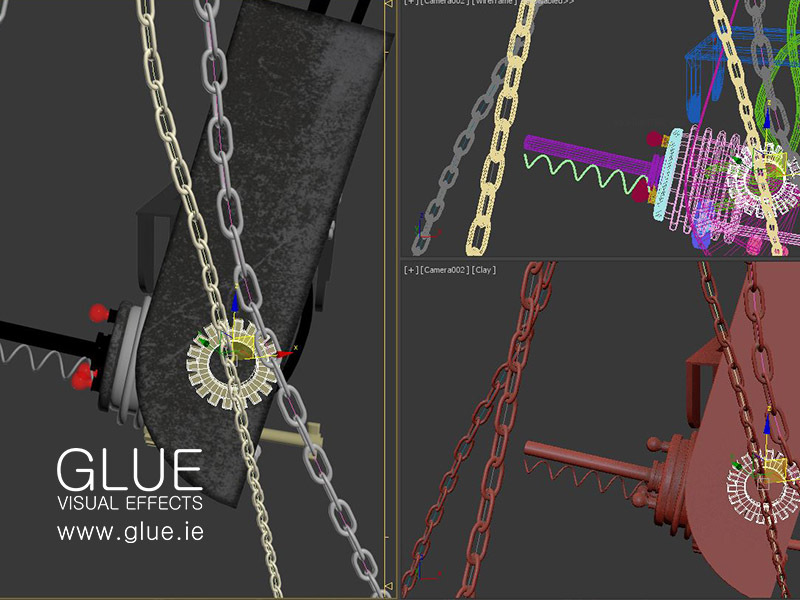 The process of modelling the chain was straightforward. 2 chain links were connected together and duplicated until the chain reached the desired length. We would then draw a spline that described the path the chain will follow, and linked the chain to the spline. To add some realism to our animation we created particle simulations in our scene. Every mad scientist has a few experiments going on in the background and our scientist has vats containing a mysterious bubbling liquid. The glass containers and liquid were modeled then we created a particle system within that space, using spheres moving vertically. The final touch was adding a water material to bring it all together. This material is transparent and deforms the light that passes through the container from behind giving a realistic effect. To learn more about liquid simulation read our blog post “Waterfalls to Rain drops – Liquids in Visual Effects”. To give the impression that this was a large castle, we modeled some Gothic style windows up high on the wall, and added some tattered curtains. To enhance the atmosphere further we created a cloth simulation to add a wind blown quality to the curtains. This reinforced the idea of a vast cavernous lair that we sought. To achieve this we placed a cloth modifier onto our curtains which helped give the properties of a flowing material. We then created a wind modifier which gently ripples the cloth. We began by creating a base 3D Model for our Halloween characters in ZBrush. ZBrush is a 3D sculpting software that is brilliant for creating characters. It allows for a very organic process that simulates working in clay. There are 3 unique character models in the scene, a male character, a female character and the Monster. Each of these characters was sculpted in ZBrush then exported into 3d Studio Max. For more on the creation of 3D Characters read our blog “St Patrick’s Day Video Part 1”. The last step in asset creation is texturing, texturing involves placing a 2D image onto a 3D object. There are a number of different ways to texture depending on the model. In this instance we had created a base character model and wanted to create several different monster templates that would be used in the scene. The modeling team unwrapped the character model in 3ds Max. Unwrapping is a process by which you flatten a 3D model into a 2D template so that you can create an image in Photoshop or another software package that sits on the 3D model. Often these flattened images look quite strange in their 2D form, but when applied to the character it really brings them to life. Our fantastic texture artists created a series of stylised character textures in Photoshop which could be applied to the models in the scene. Once we had finalised the character models and textures, it was time to combine our scene with the lighting and animation files and render the finished video.